By Word of Mouth: John Patterson still has the stereo cabinet he built in his high school woodworking class back in 1981. The fact that it's holding up well is a testament to his ability as a craftsman. He has been putting that ability to work custom crafting rustic furniture for his one-man company J.P. Woodworks. "I've always loved working with my hands and creating special works for other people and myself," John said. It was a natural extension to make a business out of something he loved to do. He also ended up designing and building his own home. 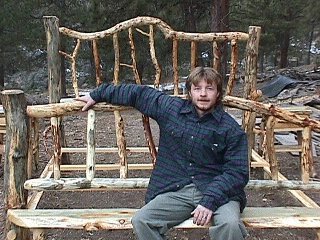 After living in Colorado for a few years John saw many rustic work and was fascinated. He learned his craft by watching other people, asking questions, reading books, experimenting, and studying others' creations. John markets his work mostly by word of mouth and trade shows in the Loveland, Colorado area. Much of John's business comes from people who have seen his work from a show, from postcards that he created to advertise his company, or on display at specialty stores in Breckenridge or Estes Park Colorado. A web site is in the works and should be online by February first. It will feature his best work. The web site will be his showroom. He currently maintains an e-mail address (jpwood@frii.com) and those who write to him will receive notice of the web site's activation. Living in the mountains provides John with a good selection of ponderosa pine, juniper, aspen, and spruce trees with which to work. Once he has a custom order he has an idea of what the customer wants and needs and from there combines just the right shapes and colors to create very functional, yet unique works of art. For people in his area John also custom builds interior and exterior railings and decks and offers a refinishing service for his customers. He also specializes in creating rustic settings with accessories such as bathroom sets and kitchen sets, mirrors, toilet paper holders, kitchen organizers, paper towel dispensers, coat and mug racks, and other custom orders. The accessories are meant to compliment and accent a rustic décor or to create a rustic décor if used in a home with more a contemporary style. From Log Home Design Ideas Magazine.